One of the parents of my former students has the cutest family blog and often does a recap of her family life called "Ten on Tuesday." She's a brilliant writer and I always look forward to her posts, and I'm taking a little creative license and putting my own little spin on her creative series, "Three Things on Tuesday." 1. I got brand spankin' new glasses today. I am pumped about this. My previous glasses were five years old and four prescriptions off. My sweet eye doctor, who I've gone to since I was in second grade, strongly encouraged I get new glasses at my last appointment. I usually wear my contacts but my old glasses were looking a little rough. I mean crooked and bent and looking like a hot mess rough. I am pumped about my new lenses because I can rock a high bun and specks for our 100th day of school. I'm strongly encouraging my sweeties to come to school dressed like they are 100 years old but a high bun and some glasses are all I've got. ;) I'm the teacher, so I get to take shortcuts like that. 2. When things get tough, I rock out to Miranda Lambert and Kellie Pickler. True Story. Even though I have the sweetest group of second graders ever, this year has been extremely hard professionally. So therefore, I like to blast and I mean blast, Miranda and Kellie on my way to work or jam out to my Miranda Pandora station in my classroom. It pumps me up and I get through another day. 3. DARE is painful. Very painful. It's the worst version of show and tell ever. Today our friendly DARE officer showed my kids a picture of marijuana and talked about the dangers of sniffing household chemicals. Nice. 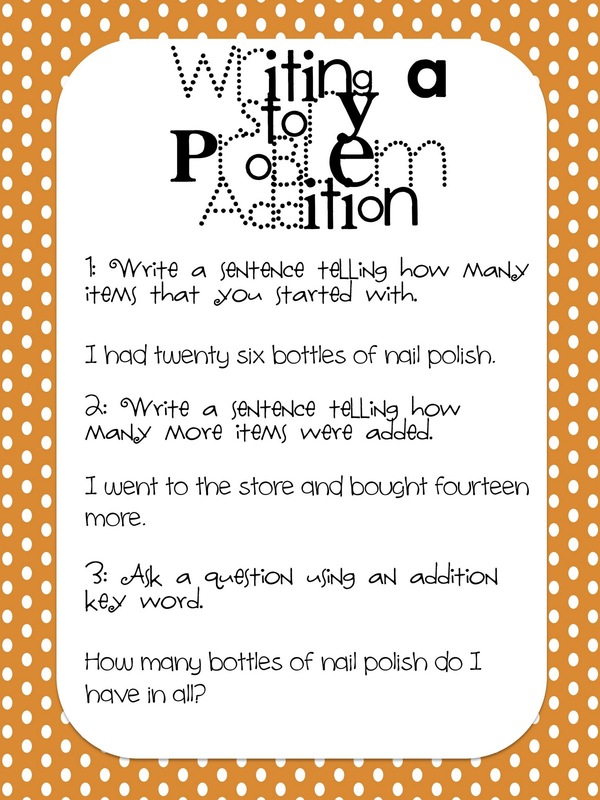 Well anyways, as my sweet grandmother says, my district uses Investigations and Investigations is big on having kids create their own story problems. Which is good because that is a common core standard and it shows true understand of the concepts of addition and subtraction. However, it's always so hard to get quality story problems! So I created these anchor charts to use tomorrow. Hopefully they make a difference! Tell me one thing about your Tuesday. Ready, set, go! On my Tuesday...I finished my wreath!! I'll post a pic on tomorrow's post.. I can't wear my contacts anymore so I love my 2 pairs of glasses. Since I wear everyday now, I need to switch it up ! My Tuesday was good, my very best teacher friend had her 2nd baby girl today so went shopping for sweet girlie things after school. Now I am procrastinating finishing touches on my report cards, this is sooo much more fun !! I love this idea! 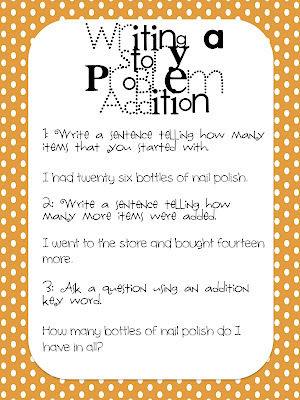 I have always struggled with teaching the kids how to write theri own problems. Thanks for the freebie! I am a new follower. Thank you for these! :) You're the best!